Can Your House Design Services Company Do Simple to Elaborate? This website is provided “as is” without any representations or warranties, express or implied. 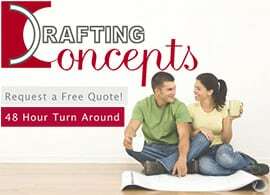 Drafting Concepts makes no representations or warranties in relation to this website or the information and materials provided on this website. These limitations of liability apply even if Drafting Concepts has been expressly advised of the potential loss. matter which it would be illegal or unlawful for Drafting Concepts to exclude or limit, or to attempt or purport to exclude or limit, its liability. [Without prejudice to the foregoing paragraph,] you agree that the limitations of warranties and liability set out in this website disclaimer will protect Drafting Concepts’s officers, employees, agents, subsidiaries, successors, assigns and sub-contractors as well as Drafting Concepts. The copyright in this website and the material on this website (including without limitation the text, computer code, artwork, photographs, images, music, audio material, video material and audio-visual material on this website) is owned by Drafting Concepts [and its licensors]. Drafting Concepts does not grant you any other rights in relation to this website or the material on this website. In other words, all other rights are reserved. For the avoidance of doubt, you must not adapt, edit, change, transform, publish, republish, distribute, redistribute, broadcast, rebroadcast or show or play in public this website or the material on this website (in any form or media) without Drafting Concepts’s prior written permission. Drafting Concepts takes the protection of its copyright very seriously. If Drafting Concepts discovers that you have used its copyright materials in contravention of the license above, Drafting Concepts may bring legal proceedings against you seeking monetary damages and an injunction to stop you using those materials. You could also be ordered to pay legal costs. Contact Your Leading Drafting Service Professionals for Brisbane, Sunshine Coast and across South East Queensland. How Many House Design Quotes Should You Get? NewHouseDesign.com.au is managed and maintained in association with Drafting Concepts Pty Ltd. This website is provided 'as is' with the intent of providing general information only and does not constitute as advice. © New House Design 2019. Allegiant theme by CPOThemes.